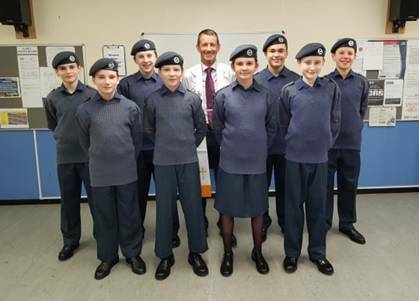 The Squadron Padre at 2443 (Okehampton) Squadron, Padre Simon Bourne, attended hi final parade recently before moving on to adventures new. In a fitting final flourish he bowed out after officially enrolling eight cadets into the Squadron and the RAF Air Cadet organisation. Simon originally joined 2443 (Okehampton) Squadron as a cadet in 1991 and left in 1997 having attained the rank of Cadet Warrant Officer, the highest rank achievable as an Air Cadet. Simon joined the Squadron as Padre in 2013 and during his time with the Squadron he has watched both his sons, Caleb and Rueben, as they progressed through the Squadron as cadets, finally achieving the ranks of Flight Sergeant and Sergeant respectively. Both Caleb and Rueben decided to leave the Squadron last year to concentrate on their further education. 2443 (Okehampton) Squadron Officer in Charge, Flying Officer David Wilkinson said "I think I can speak for all members of the Air Cadet Organisation past and present when I say that we wish Simon, Caleb and Rueben all the very best for their future endeavors".